Video marketing is undoubtedly the most effective way for your brand to engage with potential customers, but sometimes it goes wrong. Whether the company misjudges the mood or takes its eye off the ball when it comes to its target audience, even some of the world’s biggest brands have royally stuffed up their video strategy. 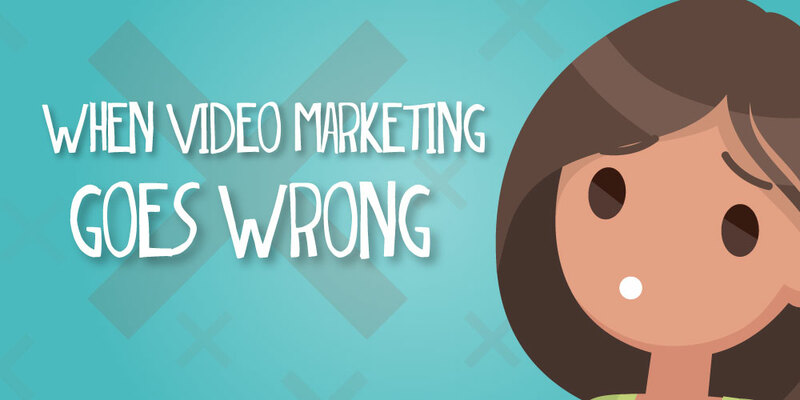 Here are some examples of when video marketing goes wrong, and some handy hints on how you can avoid a similar fate. Being clever with video marketing is great, but you can try to be too clever. What sounds great in the mind of a top exec might not necessarily translate into the message that the video actually transmits to the public, and Apple found this out to their dismay. The problem here is that, although someone high up in Apple might dream of a world where iPads are the primary form of communication, no real, actual people fantasize about that and, indeed, the reality is that most business is still currently performed on traditional computers. They are clearly trying to target Millennials using the concept of what they think Millennials MIGHT want, rather than doing their research and finding out about the reality of the situation. In fact, the child comes across as a little rude, rather than as the ideal of hipster futurism that Apple intended. First lesson – research who you are selling to. When you use video marketing, you might want to use humour, but you need to remember that this is a clip to show off and enhance your brand. You are not writing for a comedy sketch show. With that in mind, beware of offending your potential client base. Car maker Hyundai feel into this trap with their Pipe Job advert. The video features a man attempting suicide by taping a pipe to the exhaust of his Hyundai and running it through the window whilst he sits inside. The twist is that, because the model in question pumps out nothing but water vapour, he survives the attempt. Understandably, the company pulled the ad after a public outcry. They were accused of trivialising suicide and quickly apologised. Although this might be the sort of thing you see on a late night comedy show, where a niche audience is expecting dark humour, the idea of video marketing is to appeal to as many potential customers as possible. When this kind of joke is unexpected, it can cause huge offence and be detrimental to the brand. Second lesson – use humour if you like, but be careful not to offend. At Big Zoo Media, we have created effective video campaigns for some big name clients and we can do the same for you. We work with you to hone the message and produce the best possible videos for your target audience. Take a look at the work we have completed in the past, and just think about what we can do for you.